Last night’s lightning storm was the most spectacular I’ve ever seen. For more than an hour there was barely a two-second gap between lightning flashes. Unbelieveable! When the storm started, Martine and I were on our way home from dinner at a sushi restaurant. I pulled the car into a parking lot with a wide-open view to watch the show (this was before the rain started). 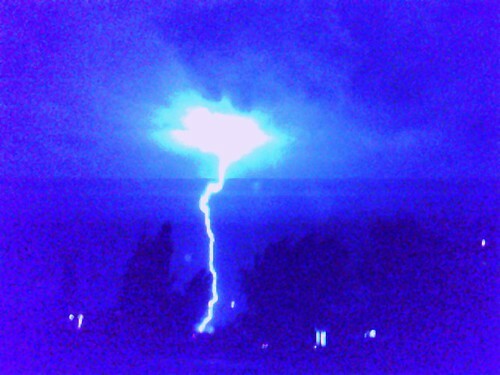 We both got out our phones and attempted – successfully – to capture a lightning flash with the phones’ cameras. You can see the results below. Martine’s is on top and mine is below. 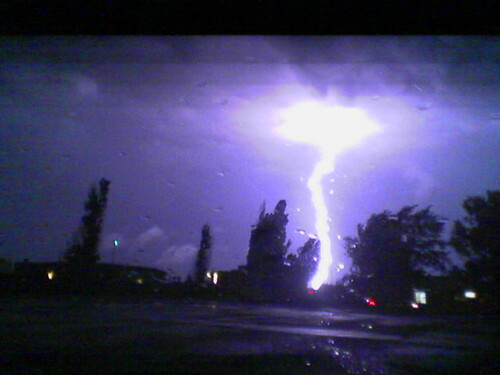 Aside from the fact that we both managed to capture the same bolt of lightning on these crude cameras, this serves as yet another indication of just how bad the camera in my Motorola v710 is (she uses an LG 6190). The storm, however, got its revenge. The power went out around 9:00 and as of this morning it is still off. Hydro Quebec says it might not be back until Thursday night! Holy hell that is a hell of a camera. I got caught in the deluge last night and welcomed it. I think I`ll write about it. Wow, Patricia, those are awesome photos. I particularly like the first one, where the layer of cloud is like the underside of a big ol\’ dusty carpet. I tired with a 3.1 mp to take some pics. It didn’t work, maybe I should get a new one ! It was pretty impressive. Speaking of storm and technologies, on my way back from the Yulblog meeting, my Clié got wet and is now DOA. Oh crap, that’s too bad. That was a fine looking Clié. I had my eye on that model when I went PDA shopping a while back. Ended up with the Palm Zire 72s. The top one reminds me of the Lord of the Rings movie, when the bad guys were being ominous and electrical.